The Mars Global Surveyor Mars Orbiter Camera (MOC) wide angle system is used to monitor changes in martian weather and the seasonal coming and going of polar frost. These four wide angle pictures of craters in both the northern and southern middle and polar latitudes of Mars show examples of frost monitoring conducted by the MOC in recent months. It is spring in the northern hemisphere, and frost that accumulated during the most recent 6-month-long winter has been retreating since May. 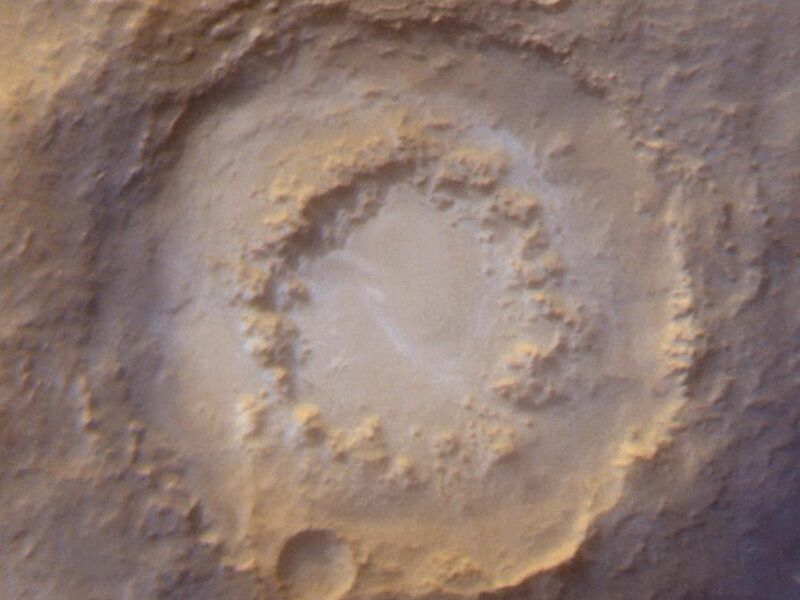 Examples of frost-rimmed craters include Lomonosov (top, left) and an unnamed crater farther north (top, right). 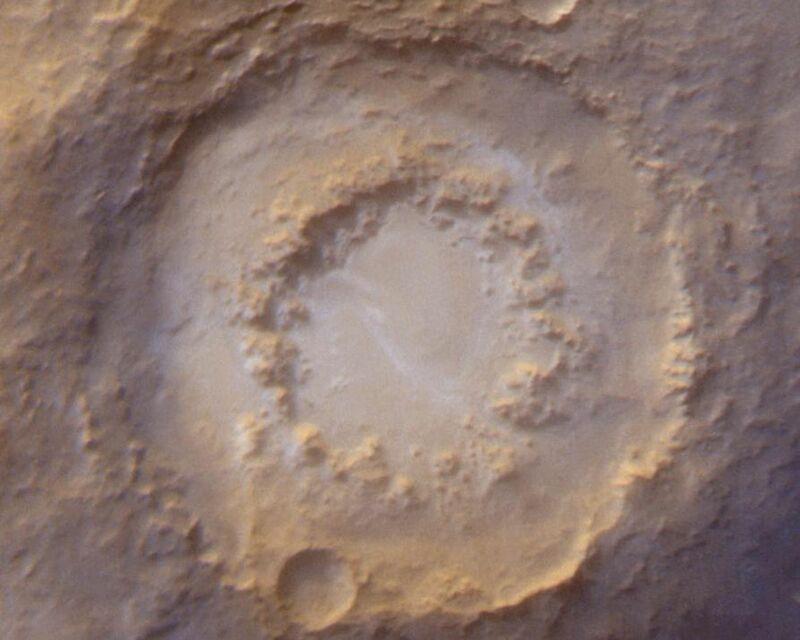 The unnamed crater has a patch of frost on its floor that--based on how it looked during the 1970s Viking missions--is expected to persist through summer. It is autumn in the southern hemisphere, and frost was seen as early as August in some craters, such as Barnard (bottom, left); later the frost line moved farther north, and we began to see frost in Lowell Crater (bottom, right) in mid-October. 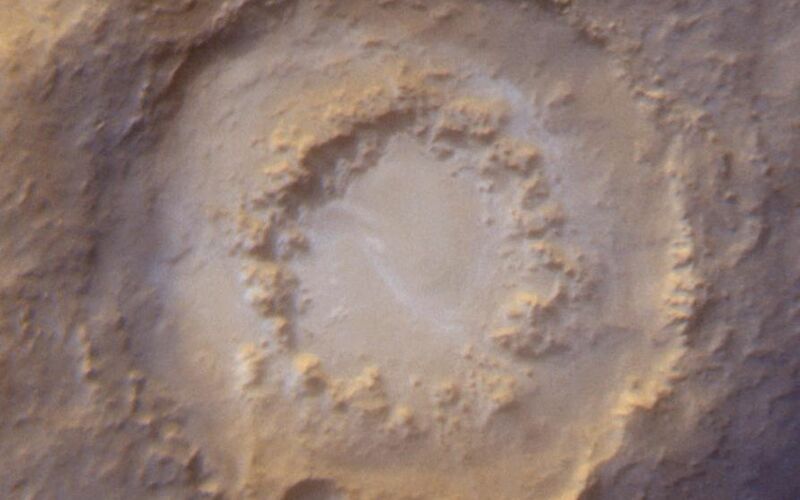 For a view of what Lomonosov Crater looked like during northern winter, see "The Frosty Rims of Lomonosov Crater in Winter." This is a series of 4 images. Each image is a composite of two pictures obtained at the same time, a red wide angle view and a blue wide angle view. In each picture, north is toward the top and sunlight illuminates the scene from the upper left (for southern hemisphere) or lower left (for northern hemisphere).